BR Standard 4-6-2 No. 70000 "Britannia" is hard at work at the head of the 12 coach 1Z40, "The Cathedrals Express", 09:36 from Paddington to Stratford-upon-Avon. It is approaching the foot-crossing at Wormleighton a few minutes early at 12:11 on Saturday 23rd April 2011. This was the hottest day of the year so far, but with the loco working hard and being fired, some visible exhaust is apparent. 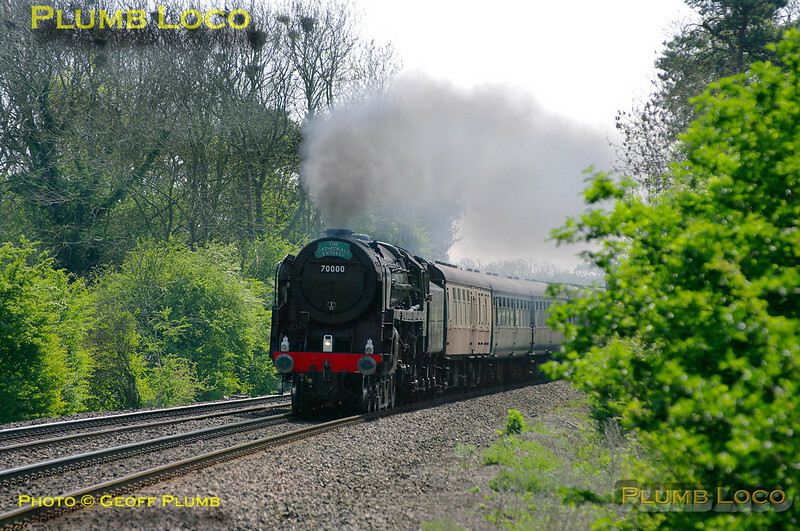 The loco is still carrying its unlined black livery and is without its nameplates. Digital Image No. GMPI8813.